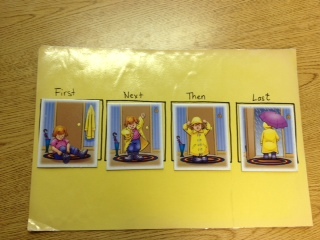 When I am working on sequencing cards, I like to have a visual template for the students to place the picture cards on. This is especially helpful with my ASD population. I have made several different templates for all of my cards. 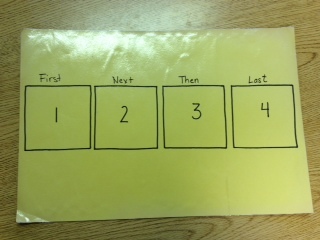 For my four step sequences, I trace around each card on a 12 x 18 piece of construction paper and put the numbers in the box. Then, I write 'first, next, then, last' above each corresponding box. This gives students a great visual for placement and also a sentence starter for describing the scenes. I also laminate the paper for durability. I love how this template facilitates my students creating sentences using story telling vocabulary. 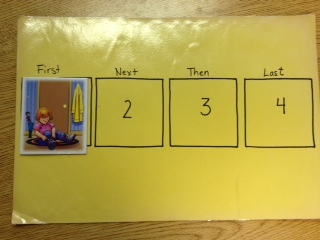 Let me know how you work on sequencing!